They played in the first NHL game at Toronto’s Maple Leafs Gardens in 1931, and they were there at the last, 68 years later. Red Horner had worked the blueline that opening night for the Leafs, while Mush March was a member of the visiting Chicago Black Hawks, scoring on their behalf the first goal in the history of the rink that Conn Smythe built. On Saturday, February 13, 1999, when the same two teams met for the final game at the Gardens, March and Horner, both 90, were on hand to drop a ceremonial puck. Like them, that was an original, too: March had kept the one he’d scored with in ’31, carrying it with him, back to Toronto, from his home in Illinois. Then, hockey. In 1931, Chicago beat the Leafs 2-1. They did it again in ’99, this time by a score of 6-2. Frank Mahovlich scored a pair of goals on this date in 1968, the day of his 30thbirthday, powering his Toronto Maple Leafs to a 2-1 win over the visiting Detroit Red Wings. But the man they called the Big M wasn’t long for the Leafs at that point: a little more than a month later, after almost 12 years in the blue-and-white, Mahovlich was traded to those very same Wings in a seven-player deal. 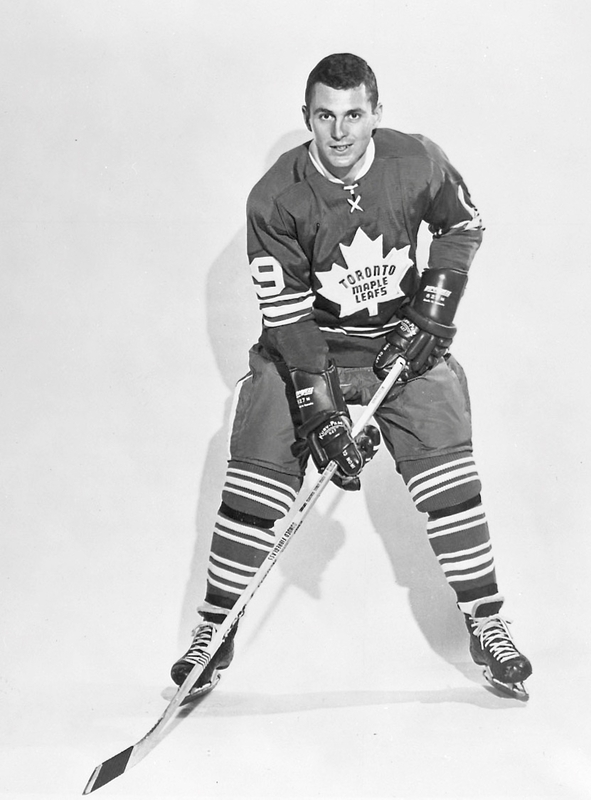 Heading for Detroit with him were Pete Stemkowski, and Garry Unger (along with Carl Brewer’s rights); the return for the Leafs was Paul Henderson, Floyd Smith, Norm Ullman, and Doug Barrie. Mahovlich had his ups and his downs when he returned to the fold in ’67, dominating one night, lagging some others. The boos continued. 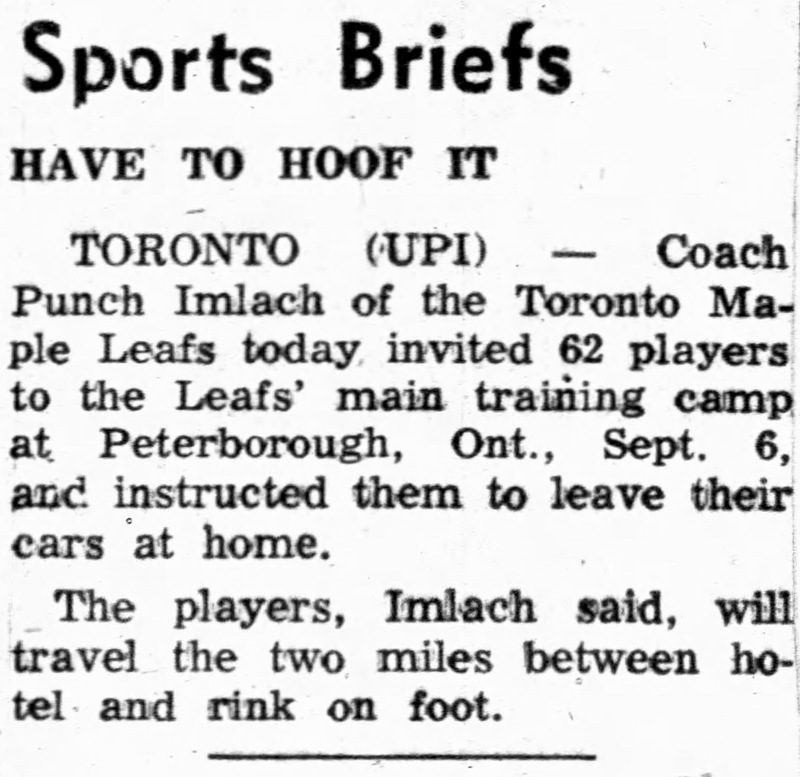 Leafs coach and GM Punch Imlach was said to be dissatisfied, too, with Mahovlich’s defensive play, and by time Imlach sent him to Detroit in March of ’68 all the talk of rifts between coach and fans and player meant that the trade didn’t come as a surprise to many. That’s not to say it didn’t traumatize Toronto. Indignant fans jammed the switchboard at Maple Leaf Gardens with complaining calls the morning the deal was announced, while others out in front of the rink stopped traffic on Carlton Street with their moody milling. In the wake of the trade’s announcement, The Globe and Mail reported that shares in MLG Inc. fell by $1.50 on the Toronto Stock Exchange. For Mahovlich, the shift to Gordie Howe’s Red Wings was as good (on the ice) as a rest: he would thrive in Detroit, scoring a career-high 49 goals the following season, 1968-69. He eventually went to Montreal, where he enjoyed his best years, statistically, in a three-and-a-half-year stint that saw him help Canadiens to Stanley Cup championships in 1971 and ’73. Mahovlich played three seasons in the WHA after that, returning to Toronto as a Toro in 1975 before following the team when they moved to Birmingham, Alabama, and reconstituted as Bulls. 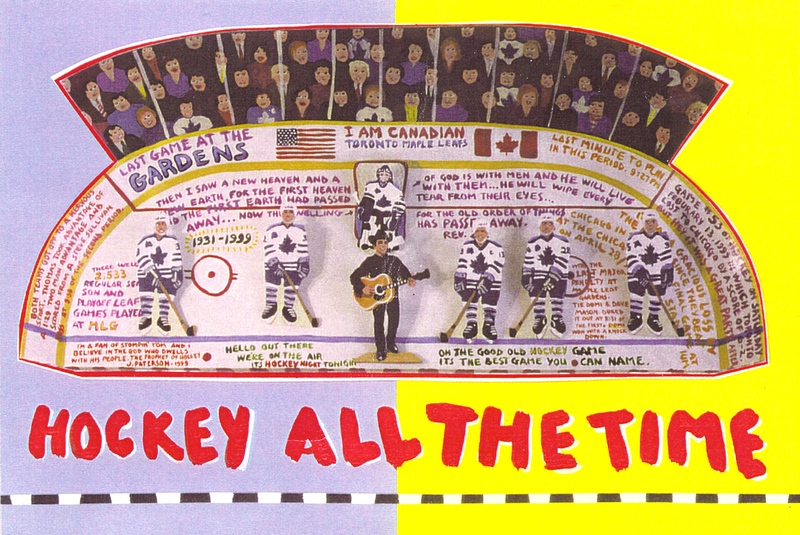 It was the final weekend of the NHL’s 1959-60 season, towards the end of March. On the eve of the playoffs, the Toronto Maple Leafs had a couple of games to go before they got down to the business of chasing the Stanley Cup. Sunday they played their final regular-season game in Detroit, forging a 3-2 win in which goaltender Johnny Bower was the acknowledged star. Bower hadn’t done badly the night before either, back home at Maple Leaf Gardens, outduelling Chicago’s Glenn Hall in a 1-0 win that saw Frank Mahovlich set up Red Kelly’s winning goal. Writing it up for the hometown Globe and Mail, Rex MacLeod recognized that “Pierre Pilote, most underrated defenceman in the league was a standout for the Hawks in a game that had occasional flurries of high-speed action, excellent goalkeeping, fine defensive work plus solid bodychecking.” A photographer from the Turofsky’s Alexandra Studio’s caught some of that here. 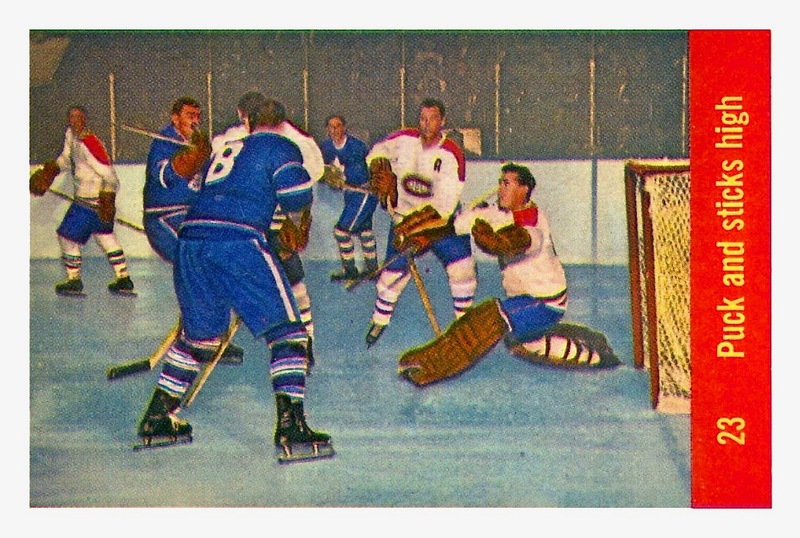 Reproduced in 100: A Century of NHL Memories (2017), an anthology of photographs drawn from the vasty vaults of the Hockey Hall of Fame in Toronto, this image shows Pilote upending Leafs’ right winger Gerry James while Hall secures the puck in his crease. The other Hawks shown are (back left, wearing number 8) winger Murray Balfour alongside defenceman Moose Vasko. Obscured, mostly, by James and Pilote, that’s Bobby Hull in back. He didn’t make the cut at all when football star and artist Tex Coulter came to translate the scene to canvas. 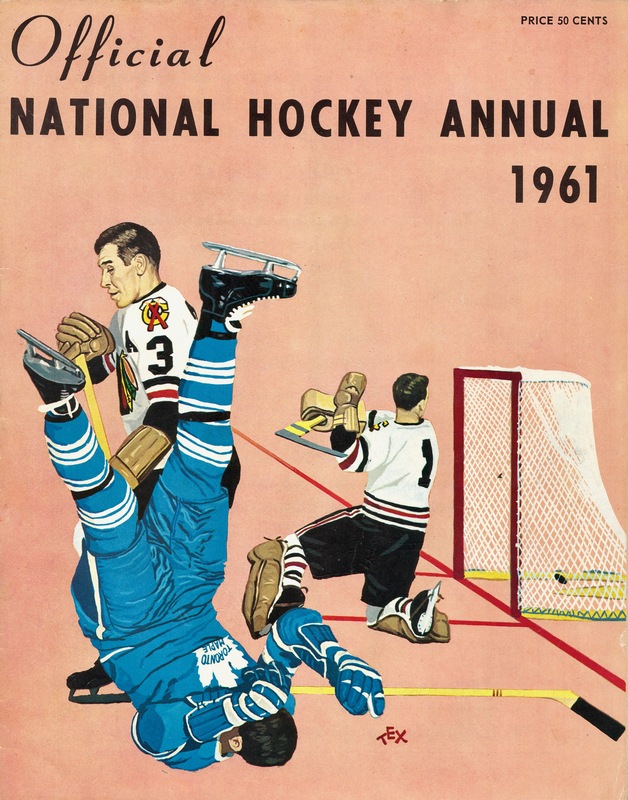 Then again, Glenn Hall didn’t fare a whole lot better in the painted version, here below, that would adorn the cover of the NHL’s 1961 Official Annual, snatching away Hall’s real-save save to pose him looking back, too late, at the goal he couldn’t foil. 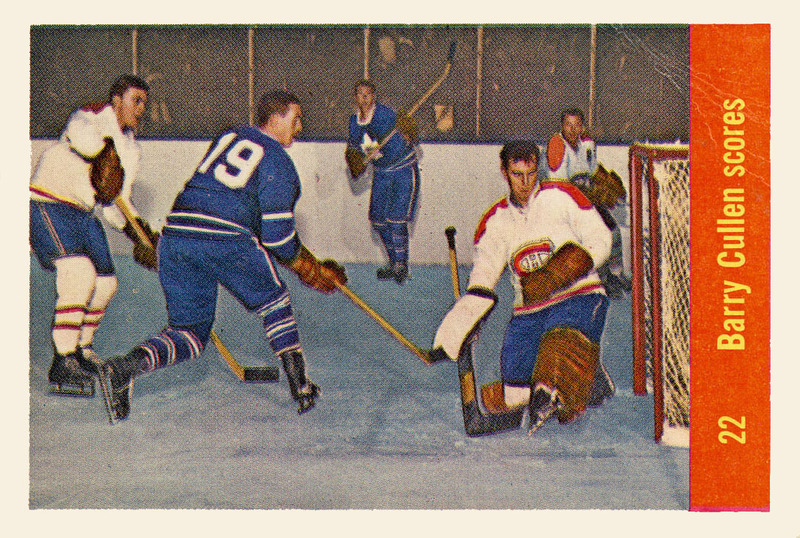 One Night Only: A photographer from Parkies happened to be on hand at Maple Leaf Gardens the night Len Broderick played his lone NHL game in 1957, which is how his performance ended up immortalized on a pair of hockey cards. 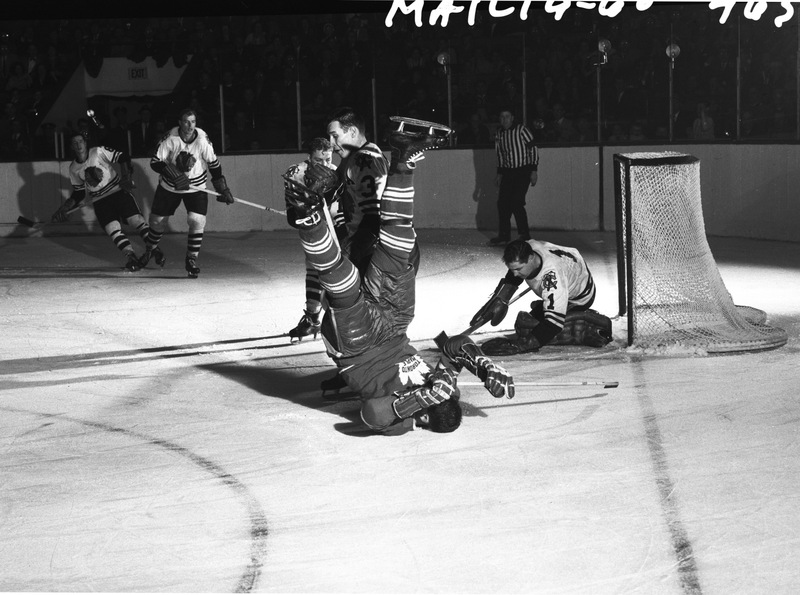 Above, Montreal’s Doug Harvey stands by his goaltender while Sid Smith and Tod Sloan hover. A crowd of 14,092 would eventually make their way to Maple Leaf Gardens in Toronto that Wednesday night late in October of 1957. Len Broderick was one who’d come to watch the hometown Maple Leafs take on the Montreal Canadiens, the reigning Stanley Cup champions. Toronto-born Broderick, who’d just turned 19, was a student at the University of Toronto who also kept the nets for Toronto’s Junior-A Marlboros, with whom he’d won a Memorial Cup in 1956. Broderick never got to his seat at the Gardens that night. Instead of settling in to watch the evening’s proceedings, he’d soon be lacing on skates and pads to head out on the ice wearing Jacques Plante’s own number one Canadiens’ sweater to play — and win — his first and only NHL game. Teams still didn’t carry regular back-up goaltenders in those years. In case Ed Chadwick fell injured, the Toronto Maple Leafs kept practice goalie Gerry McNamara on stand-by. As mandated by the NHL, the Leafs also had a second goaltender on call for the visiting team. That’s where Broderick came in. Only a week had passed since Plante’s return to the ice after a sinus operation and now he was fluey and his chronic asthma was acting up. Gerry McNamara was older, 23, more experienced and if the Leafs could track him down, then he’d be the man to take the Montreal net. They couldn’t; at twenty to eight, Broderick was told he was the man. “Holy cow was I surprised when I heard I was going in there,” Broderick later told The Toronto Daily Star’s Gordon Campbell. Leaf wingers Barry Cullen and Bob Pulford beat him late in the game, while Canadiens were shorthanded. 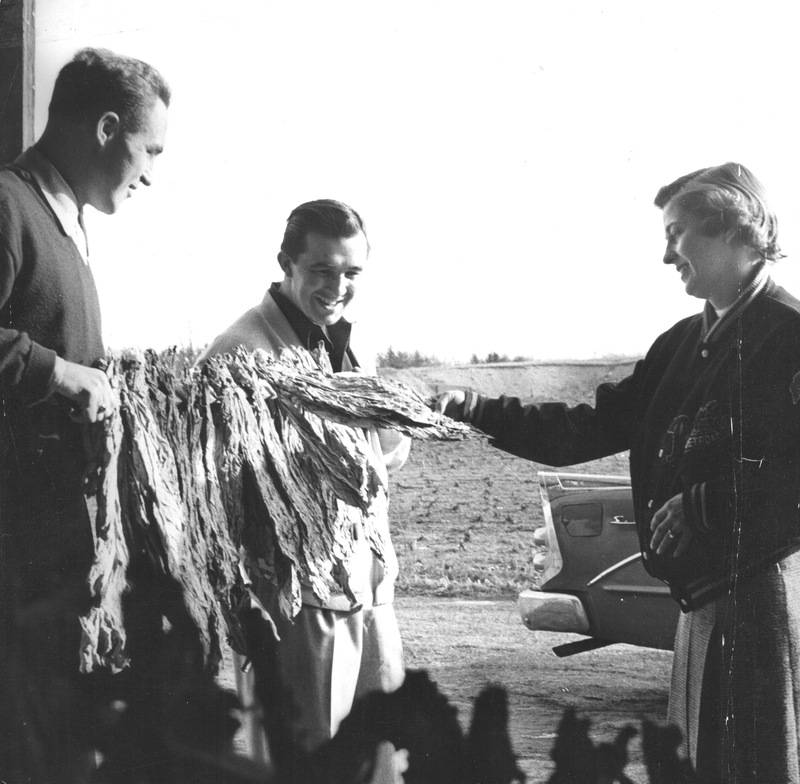 “It’s doubtful if even Plante could have stopped either of those drives,” Proudfoot advised. Only two pairs of goaltending brothers have made it to the NHL: Len and his late younger brother Ken, who’d later suit up for the Minnesota North Stars and Boston Bruins, along with Dave and Ken Dryden. They used to pay me, I think it was $25 a game, to go and watch the games. We sat in Connie Smythe’s box, so they knew where we were. My dad had not been to a Leafs game for a number of years and his boss that day had asked him if he wanted to go — he had an extra ticket. So we went around and picked up his boss. I was supposed to be there at seven for the eight o’clock game. We were a little late — I got there about seven-fifteen. At the gate they were jumping around, and then they saw me and they said, hey, get in here you’re playing, we gotta find your equipment. [Laughs] Jacques Plante had an asthma attack and you’re it. My dad had no idea until I came out on the ice. In the visitors’ dressing room, they gave him Plante’s sweater, number 1, to wear. Maurice Richard came over and sat down and started talking to me, I guess thinking he was settling me down but … He introduced me to some of the players. He just sat and talked while I got dressed. Well, everything was happening so fast, I didn’t have a lot of time to do a lot of thinking about it. It was get ready and get out there. I didn’t see Plante — I never saw him. I assume he wasn’t there. Toe Blake came over to shake hands. 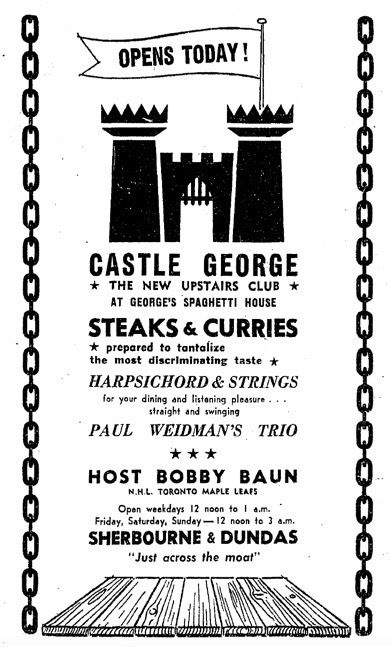 He was chasing after Geoffrion because Geoffrion was throwing up — he’d told him not to eat that pasta. He was busy with that. What kind of goalie were you? Stand-up. Not like they do it now, butterfly. I had Turk Broda as a coach and he was a stand-up goaltender. He would kneel down behind the net and watch people shooting on me. He taught me. And he usually picked me and drove me to practice, so I got to know him pretty well. What was it like to skate out in front of an NHL crowd? It was certainly different. The game where we beat the Junior Canadiens to win the Memorial Cup, we had the largest crowd they ever had in Maple Leaf Gardens. They didn’t play overtime, so we played an eighth game, it was a Wednesday night, I remember it: they were standing four and five deep in the greys. So it didn’t bother me, a big crowd. 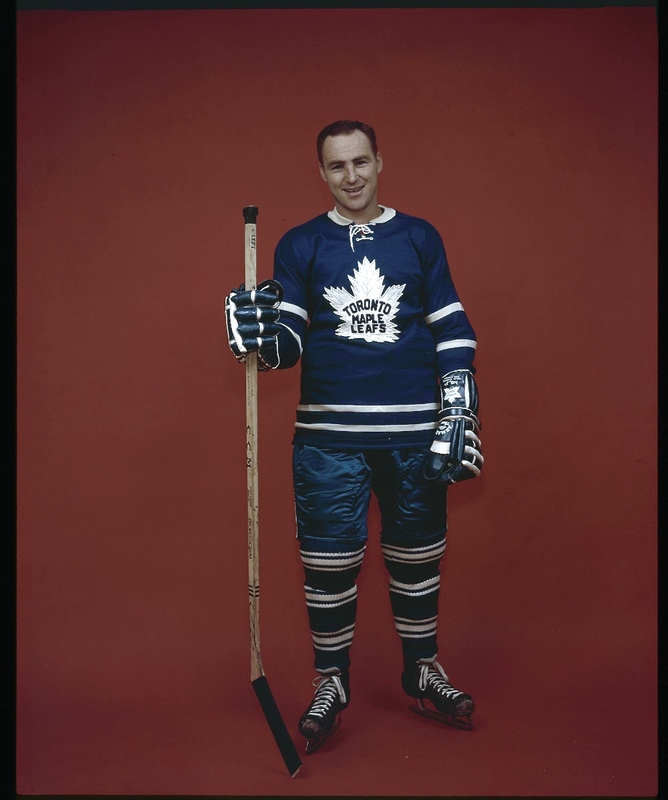 I had gone to Leaf camp that year and in shooting practice there, Frank Mahovlich would come down, dipsy-doodling, and he kept putting the puck between my legs — to the point where he and I were both laughing about it. I wasn’t stopping it, and he just kept putting it in. So fairly early in the game, he got a breakaway. I was determined, I said to myself, he is not putting that things between my legs. So I really kept my legs tight together. He tried it, of course, and as he was circling, he looked back. You could see the surprise on his face that he didn’t have a goal. That was pretty early in the game. Once I was in the game, I was in it. I had a shutout with about ten minutes to go. It was a great team I was playing with — probably one of the greatest NHL teams ever. I had Doug Harvey and Tom Johnson in front of me. They blocked a lot of shots. That’s what they did — they were very good. Broderick faced 22 shots before the night was over, compared to the 38 that the Leafs’ Chadwick saw at the other end. Broderick had his photo taken after the game, standing between the Richard brothers, Henri and Maurice. Some fuss would follow as the week went on, but at the Gardens, Broderick just packed up his gear, and handed over Plante’s sweater. Then he drove home with his dad. He was pretty pleased with the whole thing. There was a lot of press and that the next day. It was great. I was at the University of Toronto at the time, in Commerce, and there was a film crew over there, got me out of class. Frank Selke sent me a very nice letter. If [an emergency] goaltender played, they only had to pay him $100. He sent a cheque for $150. He talked about how it wasn’t as easy to go against your own team. On their way to winning another Stanley Cup the following spring, the Canadiens would get the help of another emergency goaltender, John Aiken, in Boston. As for Len Broderick, he played another year for the Junior-A Marlboros before leaving the nets for good. Did he think of pursuing an NHL career? They weren’t paying any money. There were no masks. And I just didn’t feel it was worth it. At that time, for a first-year player, it was 8,000 a year. 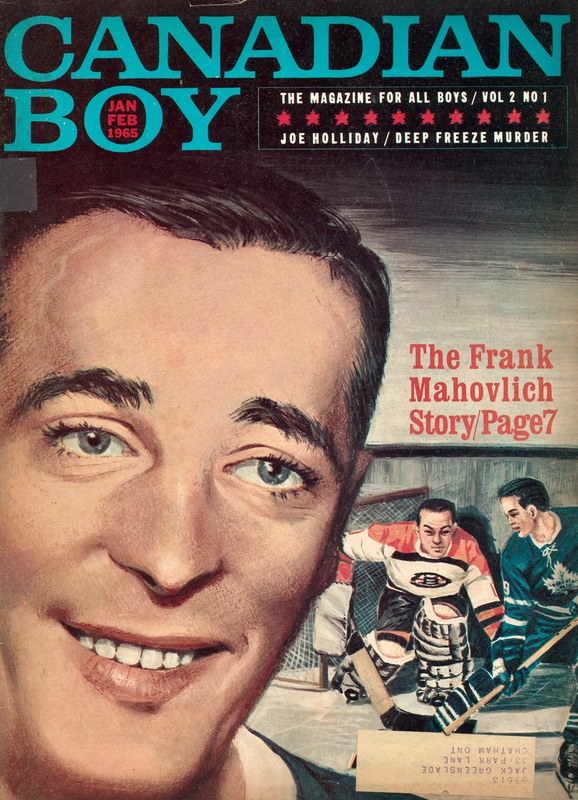 Frank Mahovlich, even, that’s what he got. Staff Smythe called me at home, he wanted me to come to Leaf camp, and I said, how much are you going to pay me? The first year was eight thousand. I was in the chartered accountant course at the time and I just said, I gotta get past this. I probably had 75 stitches in my face, top of the head, over the years. [Chuckles] Eventually I just thought, why should I get banged around and hammered for 8,000 a year? No, not much. I’m very happy with my career. I have two or three hockey cards to remember that night. When my brother came through, I guess it was three years later, salaries had gone up quite a bit. That’s when they were starting to go up. And he got to play with the Canadian Olympic team, out of the University of British Columbia. That wasn’t there when I finished. 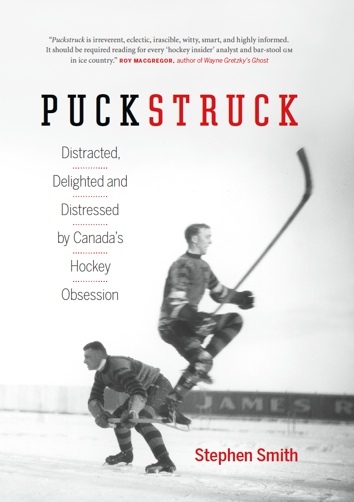 Non-Stop: Toronto’s Barry Cullen scores on Len Broderick. That’s Montreal’s Jean-Guy Talbot arriving too late. In the background are Leaf Ron Stewart and Montreal’s Doug Harvey.